Coxilhas, the typical rolling hills from Southern Brazil, are the land of old, historical cattle ranches. Many "Fazendas" here are inhabited since colonial times, when they were support bases for the gauchos that moved live troops (the “tropeiros”) from Rio Grande do Sul to Sao Paulo. This off-the-beaten-track 8 days/7nights horse-riding trip takes you through a very remote area of Southern Brazil: Coxilha Rica, in the Santa Catarina highlands. 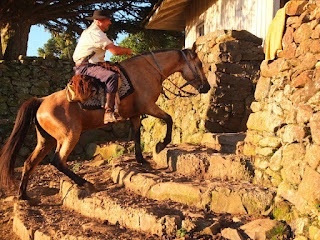 A region that offers a mix of beautiful scenery and authentic gaucho culture. Depending on the itinerary, you will ride our amazing criollo horses inside the remains of the stone corridors that ran for hundreds of kilometres and were used by the tropeiros to avoid dispersion of the troops. In each Fazenda you will be welcomed with the warm hospitality of the gaucho and have the opportunity to try the typical local cuisine, and experience its lively culture. This is an adventure for true riders of all abilities! The 2012-2013 riding season in Coxilha Rica starts in October. Brazil Ecojourneys can offer spaces at the 28th October to 4th November departure at special last minute rates. Consult us!